What will the industrious maestro behind Tangerine do next? He’ll deliver a shot of pure, delirious, humanist movie energy, that’s what. Don’t believe the hype, as this is probably even better than the hype suggests. 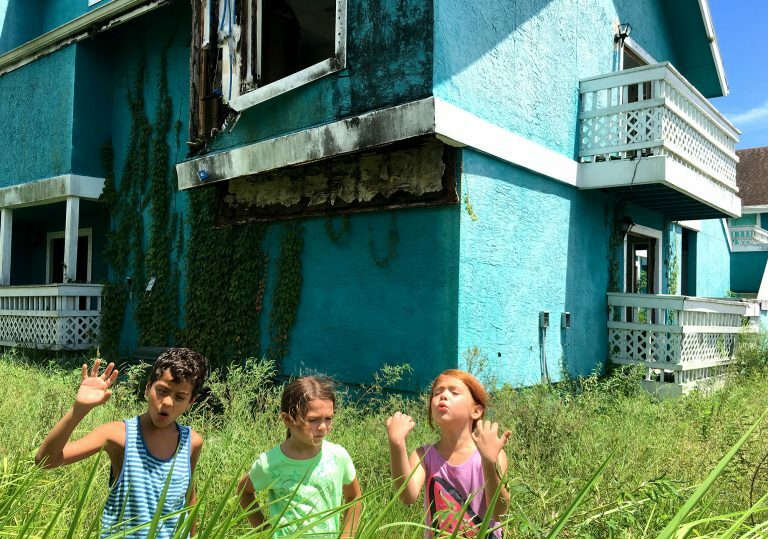 For the hair-raising opening scene of Sean Baker’s astonishing neo-realist fable, The Florida Project, three overstimulated toddlers – Moonee (Brooklynn Prince) Scooty (Christopher Rivera) and Dicky (Aiden Malik) – dash with arms ailing from The Magic Kingdom to Future Land. Though they are nestled deep in Disney country, their situation is far from enchanted, as these locations are in fact opportunist motel blocks named in order to lure holidaying saps into their grimy net. Hard cut to Kool and the Gang’s ‘Celebration’ for the opening credits, and we’re all set to go. 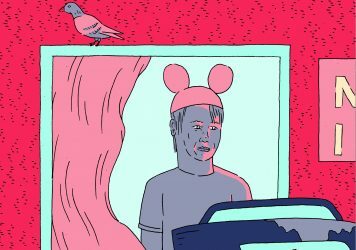 Even though the world of this film consists of outstretched carparks, giant dumpsters, novelty fast food concessions and scads of overgrown scrubland, Baker constantly assures that there is always a dash of fairy dust in the air if you know where to look for it. He carries over the raucous spirit of his pervious iPhone opus, Tangerine, and then boldly notches things up a level for this new one. It feels like his most epic and profoundly affecting film to date. And it’s not that it looks expensive or that the story is broader in scope than usual. More that it offers a trenchant and compassionate political statement about the condition of working class America without once resorting to bald point making or cliché. Bria Vinaite is a major new discovery as tatted-up single mom Halley, a woman-on-the-verge who suppresses all fear and takes care of business when she has to in order to raise her wisecracking lil’ terror, Moonee. She charges towards life and doesn’t care about what others think of her, even though she doesn’t really abide by any traditional standards of motherhood. The film is about how this duo are able to keep their head bobbing above the poverty line, but it’s also about how Halley allows her daughter to exist in a world of make-believe, knowing that the crushing reality of their circumstances might sap away her infectious joie de vivre. That sense of unalloyed freedom might be the one thing keeping the tiny firecracker aflame. Then, playing the wise old sage who tries to keep crazy Halley under his wing (and out of jail), is a magnificent Willem Dafoe as doormat motel manager Bobby, a harried man who is just about able to keep his rowdy tenants in check. And that is pretty much that. The film follows the kids on their daily adventures to surrounding lots and allows us to giggle at their monkeyshines. It’s a celebration of innocence and energy, but it also never once makes out The Magic Kingdom to be an off-ramp hellhole full of life’s unfortunate dregs. This film pulses with empathy – Baker loves these places, and for more than reasons of high kitsch. Laughter and sadness co-mingle until a euphoric finale scene sends the story into the realms of pure candy-coated fantasy. It’s a breathtaking vision of fighting spirit and how the modern American underclass take any action available (legal or otherwise) for the purposes of self-betterment. Cinematographer Alex Zabe bathes the landscape in misty peach hues and laces it with never-ending rainbows. And what more is there to say? You must see this beautiful, vibrant, heartfelt and hilarious movie as soon as you damn well can, bi-yatch. 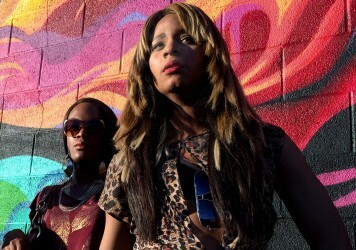 Filmmakers like Sean Baker are using every corner of the frame to shine a light on marginalised people.